IT’S five out of five for Totton Recreation Club stalwart Steve Allen on the midweek Cuestars Masters (55+) Tour. And he is now just three points behind defending champion Phil Morgan in the rankings. 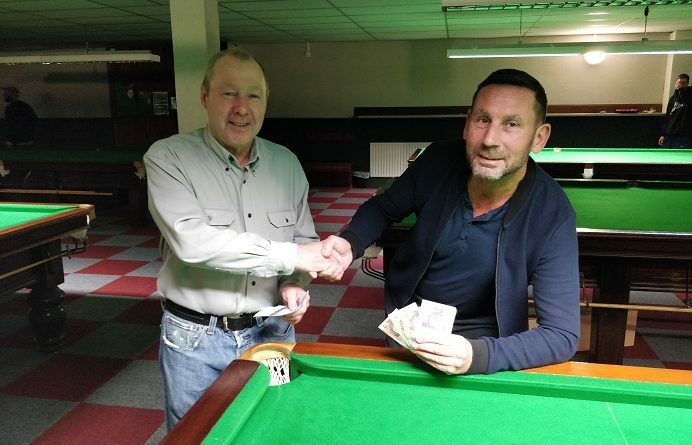 Allen pocketed £50 prize money after completing a nap hand with a 2-0 victory over third-placed Stephen Hills in the final of the third leg at Chandlers Ford Snooker Club. Hills had taken a frame off Allen in the group stages and recorded the day’s highest break of 42. Only 17 points separate the top five in the Masters rankings, which also includes points awarded on the Seniors (40+) Tour. ROUND-ROBIN GROUP A: 1st, Steve Allen (Totton Rec); 2nd, Phil Morgan (Chandlers Ford SC); 3rd, Stephen Hills (Traders, Northfleet); 4th, Terry Harbord (Bournemouth & District Constitutional Club). ROUND-ROBIN GROUP B: 1st, Herman Desmier (Bournemouth & District Constitutional Club); 2nd, Paul Burt (Salisbury SC); 3rd, Ray Mears (Sovereign, Farnborough); 4th, Graham Wallace (Salisbury SC). SEMI-FINALS: Allen 2-0 Burt, Hills 2-1 Desmier. FINAL (£50/£30): Allen 2-0 Hills.